Once life in Oudewater turned on hemp and rope. The farmers in the area around the city grew hemp on the small fields that were covered in manure and mud. And inside Oudewater the ropemakers walked their rope-walks along the ramparts. To spin the first thread for rope they bound a bundle of hempthreads in front of their bellies. That is why the people of Oudewater are called ‘yellow-bellies’. Ships brought the thread from Oudewater to the big ports, where other ropemakers worked it up into cables, hawsers, fishing-nets and sails. The great ships of the East-India Company, the man-of-war of the Admirality and the fishing-boats of the herring-fleet, they all went to sea with rope and sails from Oudewater. The ropemakers of Oudewater prided themselves on making only the very best quality. 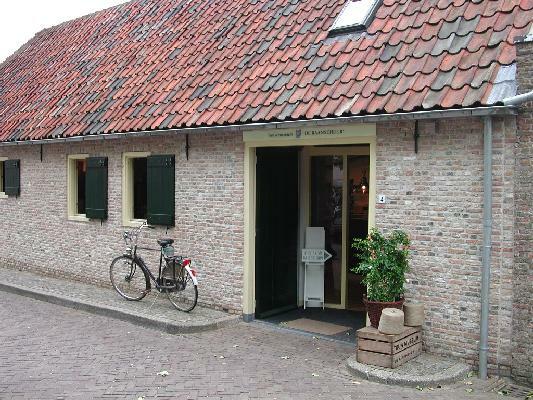 Small wonder there is a Rope-museum in Oudewater! Museum ‘de Baanschuur’ is set up in an old shed of a rope-walk for large-thread. From about 1675 till the early twentieth-century ropemakers stored their hemp, thread and utensils in this shed. In the annex, right in front of the door opening to the Wijngaardstraat, stood the great wheel. The rope-walk stretched out over about 220 meter in the street. Nowadays there is a small rope-walk in the museum. Assisted by a museumworker you can make your own piece of rope. 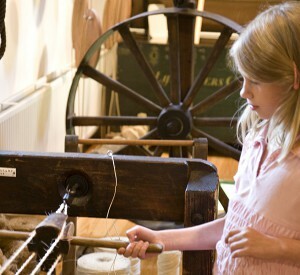 Thanks to the rope-industry Oudewater was in the seventeenth century an extremely rich city. The many beautiful gables in the city still show that wealth. But the farmers around the city also got rich and they built quite imposing farmhouses.